With so many liquor brands calling themselves "artisanal" or "craft" these days, it can be hard to stand out. But The Balvenie Scotch whisky is doubling down on its "handcrafted" brand positioning with Season 2 of its video series, Raw Craft, starring Anthony Bourdain. The series, which launched its second season last week, takes a look at American craftspeople in the narrative style of Bourdain's hit CNN and Travel Channel shows Parts Unknown and No Reservations. 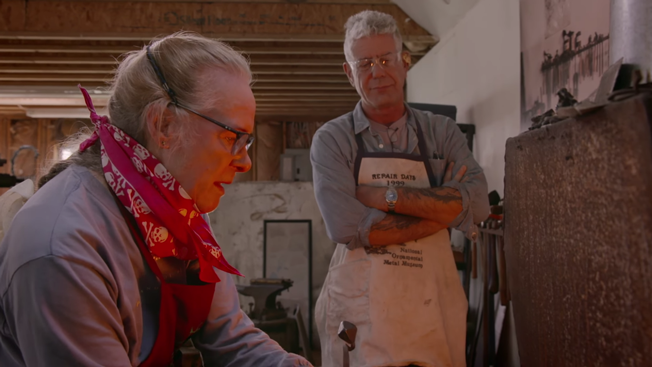 Bourdain chats with each craftsperson about the dedication and sacrifice it takes to make things the old-fashioned way—by hand. "These days the term craft has become diluted with imitators everywhere, and truly authentic stories have become more difficult to find," Bourdain said. "When a brand I've long admired like The Balvenie came to me with an idea to help uncover these hidden talents of some fascinating people who have dedicated their lives to making things the old-school, foolishly romantic way, it was tough to resist." The latest episode features Elizabeth Brim, a blacksmith and instructor at Penland School of Crafts in North Carolina who makes delicate objects like high-heeled shoes, corsets and flowers from metal. "These are people whose awesome stories deserve to be told because if we don't, who knows if in 20, 30 years these rare crafts will still be alive?" Bourdain said. The series, which tallied 2.6 million viewers for its first season, helps showcase The Balvenie's dedication to the craft of whisky-making. The Balvenie grows its own barley, uses traditional floor maltings and employs a team of coopers to tend its casks and a coppersmith to maintain its stills. "It's about pulling the curtain back," said Greg Levine, senior brand manager for The Balvenie. "[Bourdain] is a fan of the brand, so the partnership made sense. He's outspoken and brash, and says what's on his mind. For us, that was appealing because he has no b.s. about him. He does an amazing job of telling these craftspeople's stories."